Abstract: In this column, Kerry Hennigan discusses the way fans express their passion and solidarity with Michael Jackson. Hennigan, Kerry. 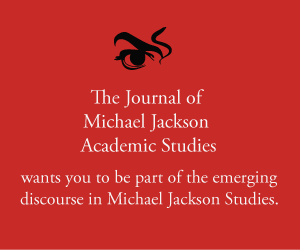 “MJ Studies Today XV (14-03-2017).” The Journal of Michael Jackson Academic Studies 3, no. 4 (2017). http://michaeljacksonstudies.org/mj-studies-today-xv/. I felt an immediate sense of SOLIDARITY with this young man. When I first became a fan, I wore MJ t-shirts everywhere and eventually collected enough to fill six boxes with different designs of both licensed and unlicensed merchandise (I didn’t really know the difference at the time). Now-a-days I’m inclined to choose my moments strategically, particularly considering some of my very favourite and irreplaceable shirts are showing signs of frequent wash and wear, and I want them to last as long as possible. How we show our appreciation of Michael Jackson publically is a matter of interest to me. The wearing of a t-shirt is a simple and popular gesture with fans. It proclaims to the world our allegiance to the King of Pop without our having to say a word. For me personally, wearing MJ t-shirts was also a part of rediscovering the importance of music in my life. Despite owning three acoustic guitars (one of them a 12-string), a mountain dulcimer and a Turkish saz as well as a large, eclectic collection of recorded music in various formats, by 2009 music as a factor in my life had faded to little more than background noise. My main passion was my Australian Rules football club (Port Adelaide) as has been the case from birth to the present day, and which involves a large fraternity of friends and family members and associated activities. But then 25 June 2009 happened, and I was jolted into awareness of just how much Michael Jackson had contributed to the soundtrack of my life, and how much of it was so, so familiar to me – even though the only album of his I owned at the time was the ET Storybook! This quickly changed after I’d watched the “Dangerous” Bucharest concert and 30th Anniversary special from Madison Square Garden on a local TV network in those early days following Michael’s passing. Without having anticipated it, I had rediscovered my PASSION for music and performance art. Yes, I fell passionately for Michael – not just his creative output, but the man himself and what I was discovering about him. I especially fell in love with the mature Michael of the 90s and 00s. Along with all his music and DVDs, I started collecting the t-shirts to display my passion at every opportunity. As a result of making my feelings about Michael obvious, I met other fans, some of whom, unlike me, had been following his career for years, and who just came up and introduced themselves to this newcomer. I’m indebted to those t-shirts for many memorable moments and first encounters – my first, obvious way of making public my feelings for Michael Jackson. It was also a conscious decision I made to help keep Michael’s memory a living presence not just in my life, but in the lives of anyone who saw me wearing one of the shirts. It didn’t take long for me to discover that there were plenty of other fans doing the same thing. If my football family was huge, my MJ family was global. Sometimes we disagree, argue and develop factions – but that’s a subject for discussion in another article. What I love best about this FRATERNITY of Michael Jackson fans is its inclusiveness and international scope. These days some of us have found other ways of expressing our love for Michael and our commitment to perpetuating his memory and artistic and philanthropic legacy. But it doesn’t take much prompting for me to bust out a favourite MJ tee. Photo: the author in an official Moonwalker promotional t-shirt at WOMADelaide World Music Festival, Australia, March 2016.